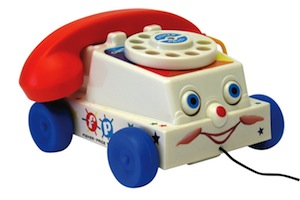 Kids love to chat on the phone and this classic, roll-along pull-toy with a friendly face, and eyes that move up and down when the toy is pulled along makes it even more fun! Since 1930, Fisher-Price has been in business to create toys that fascinate and stimulate a child's imagination. For ages 12 - 24 months.